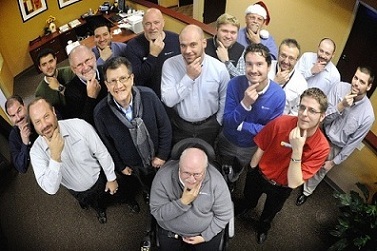 The men of Service 1st FCU in Danville, Pa., didn't shave for a month, for a good cause. This photo from Press Enterprise Inc. shows some freshly shaved faces. Seated in front, Wayne Hawley. Standing in the front row are, from left, Jeff Balestrini, Gary Surak, Brett Johnson, Jay Reed and Nick Jones. In the back row are, from left, Ed Moyer, Tom Rambo, Bill Lavage, Christopher Court, Dave Shope, Ryan Troup, Joe Bleznuck, Scott Temple, Mike Thomas and Matt Gardill. The men of the $214 million, 21,700-member Service 1st Federal Credit Union went hairy for a cause in November. The Danville, Pa., credit union observed “No Shave November” to raise funds for the Prostate Cancer Foundation. The credit union agreed to donate $100 for each employee who participated, and as it turns out, all the male employees did. Along with a dress down day, the effort raised $2,046 to help raise awareness about prostate and testicular cancer.